June | 2011 | BRING. CHANGE. SHARE. He shared about how he believes this Book brings life, how he knows this Book changes people, and how he believes it is stronger than any double-edged sword (Hebrews 4:12), he went through a series of circumstances he or others were facing and then asked, “What does the Word have to tell me about that? What does the Word say to me about that?” Then, something pretty incredible happened. People all throughout the stadium began standing up and reading Scripture. Some shouting it, in fact. And at the end, these words came across the screen, “Speak, Lord, for your servant is SEEKING.” After the main session was over, we shared the Word. Students shared what was on their heart, what they were struggling with, and then we all looked up Scripture to share with them. If you haven’t caught on already, our students began starving for the Word last night… and some for the first time. Today we are moving into day 4, and we’ll be looking at the life of Shadrach, Meshach, and Abednego. We’re watching a film produced by CIY & Voice of the Martyrs called LOVE COSTS EVERY THING, which brings focus to the persecuted church all throughout the world. It’s going to be a big day. Today we are diving into the life of Josiah, from 2 Kings 22 & 23. Through the life of Josiah, we see that he knew how to respond to God’s word. The bottom line today is for us to not only understand the importance of God’s word, but that we would be familiar with it and know how to respond. Thanks for praying for us this week. Keep it up. I can’t wait to see how studying the life of Josiah changes us. It really is as beautiful as it looks! Hey there! We made it safely and it is BEAUTIFUL here! We’re hanging out in our rooms and heading to dinner soon. Tonight’s theme is LISTEN for God’s voice. I’m so excited for this week… please continue to pray for our students this week. More tomorrow! Well, it’s 2am in Indy and we’re in the middle of Nebraska driving through rain which is supposed to put us in the middle of a storm. Everyone is tired but pretty anxious to get home so there’s little sleeping occurring at the moment. Vicki and Tina are at the helm once again. We have night duty. We enjoyed a nice evening of rafting last night accompanied by a stay at the Virginian in Jackson Hole, Wyoming. Nick read the students multiple bedtime stories a few hours ago and we thought they were asleep, but boy were we wrong. They’ve quieted down after a bathroom break but have yet to fall asleep. I am pleased to inform you, however, that all the sponsors (other than Vicki of course) are knocked out. Rick will be the next to take control and as I am told, Wesley will be his copilot. Well we have to check the radar to see how much longer we’ll be in this storm. We’ll see you all tomorrow (or if you want to get technical like Vicki, we’ll see you all today)! 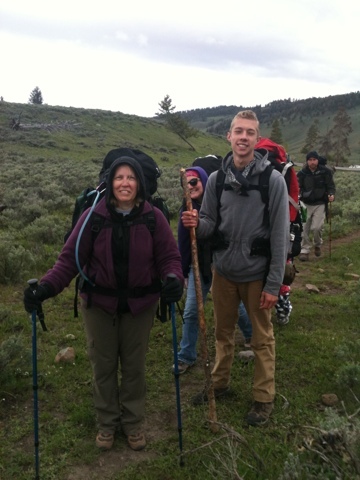 The last picture was of Jarred & Marilynne right after hiking out of our backpack trip. 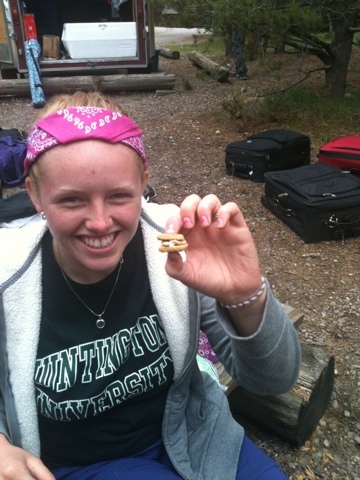 This pic is when Tina made the worlds smallest s’more! I decided to take advantage of the wi-fi signal at the Teton National Park visitors center! We’re on our last full day of the trip – hard to believe it’s gone by so quickly!! Yesterday we hiked as far into the Tetons as we could go before we hit snow. The rangers wouldn’t let us go farther because they have had a lot of avalanches in the area. But we still got to do a great 7-mile hike around Jenny Lake & up to Hidden Falls. They’ve had a lot of unseasonally late snow this year, and we found out that just a month ago, the Jenny Lake Lodge was under about 10 feet of snow! This group has not been able to do the amount of hiking that most groups get to do, but they have seen wildlife that no one else has seen! I lost count of the number of bears we’ve seen, but the last number I heard was 10! 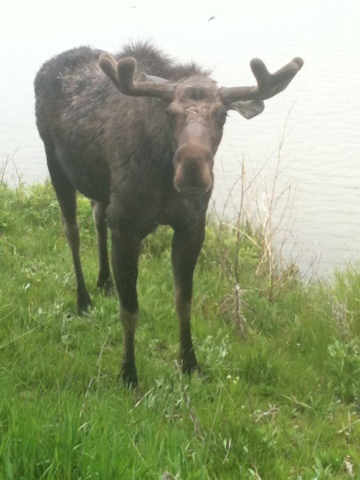 Yesterday along the trail, we saw a male & female moose drinking from a lake while a black bear played on the hill right above them! What a gift!! Today we’re doing a raft trip on Snake River, then we’ll stay somewhere in Jackson Hole before hitting the road in the morning. Keep praying for energy, as everyone is getting tired, and for continued spiritual growth. Looking forward to seeing everyone on Tuesday!